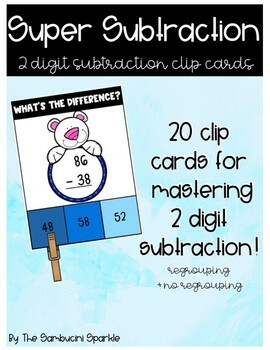 These 2 digit subtraction clip cards will work well with your subtraction unit. 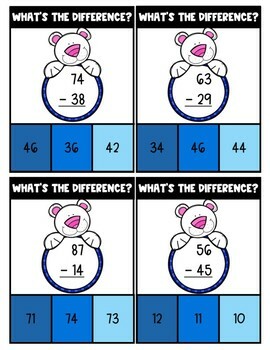 In this activity, students practice subtracting 2 digit numbers with and without regrouping. 20 clip cards are included. 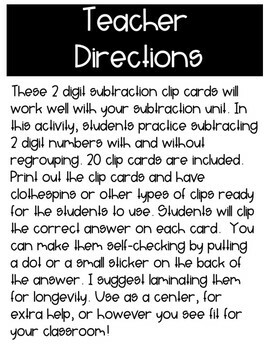 Print out the clip cards and have clothespins or other types of clips ready for the students to use. Students will clip the correct answer on each card. You can make them self-checking by putting a dot or a small sticker on the back of the answer. I suggest laminating them for longevity. Use as a center, for extra help, or however you see fit for your classroom! 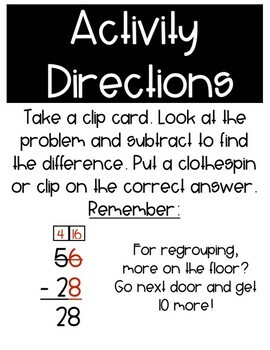 Check out my store for more math clip cards!